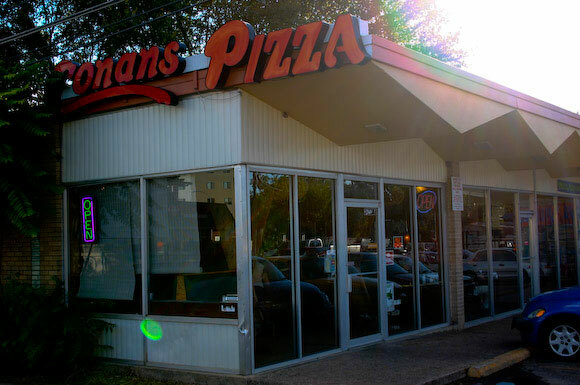 After 30 years Conans Pizza is still some of the best around Austin. They specialize in Chicago-style pizza, both deep-dish and thin-crust, white or wheat. You can choose one of their many house pizzas, or get a made to order pie. Or if you’re in the mood for something light, go for a salad. Pitchers of Fat Tire are only $9. The walls are plastered with Ken Kelly artwork (Conan the Barbarian’s creator), lending the place an otherworldly ambiance. If you go to the location on 29th Street, make sure and check out the still-visible skid-marks on the floor where a drunk driver once drove straight through the front of the pizza shop.